← See you at #NCTE16! In my incremental movement toward a high school reading/writing workshop classroom, one piece I’ve struggled with is the classroom library. I see photos of Penny Kittle’s classroom library, and I get anxious to create the same for my students. I see the value in having books at my students’ fingertips, in making it so that students are literally surrounded by books. I get it. But there are reasons that this is difficult to achieve in my teaching context. I do not have the same classroom from year to year or even for the entire school day. Our school is at program capacity in terms of student enrollment–this is 2200 students. “Program capacity” means that we have enough classrooms to offer all the classes our students want to take–we have enough science lab classrooms for the lab classes that need to be offered during a particular class period of the day, for example. We have 12 language arts classrooms and 17 teachers. We cannot each have our own classrooms. We share. And the schedule each year is an ever-changing Tetris game, different depending on the unique needs of each school year. This will be my 10th year at the school and I’ll be in a classroom I’ve never taught in before for my three senior English classes in the fall, sharing it with a colleague I’ve never shared a classroom space with before. My journalism classes meet in a totally different space, shared with the film and digital photography teachers since we all use the same computer software. If I were to build my own classroom library, I would have to move it from classroom to classroom every year. And if my reading/writing workshop classes weren’t all scheduled in the same classroom (they are this next year but they aren’t always), I would need possibly two or three classroom libraries to outfit each of my classrooms. Another solution–we could work as a department and build a classroom library for each classroom. Not a bad idea–but it’s a huge undertaking. Twelve classroom libraries. Twelve sets of book cases. Twelve (or more) copies of every book. Twelve systems to keep track of the books. And not everyone in the department is teaching through workshop, so not everyone would be invested equally. And let’s think about resources–ours (like yours, I’m sure) are limited. We have to share three class sets of computers between all 17 of us, for example. Our agreement is that no one can use them more than two days per week per class. This isn’t enough time for students to have their hands on the tools they need to write and respond to each other’s work with the frequency they need. I have to build my curriculum around when I have access to these machines. I have a difficult time with directing so many resources to building twelve classroom libraries when we don’t even have the basic tech tools our students need in every classroom. But let me tell you about our school library. 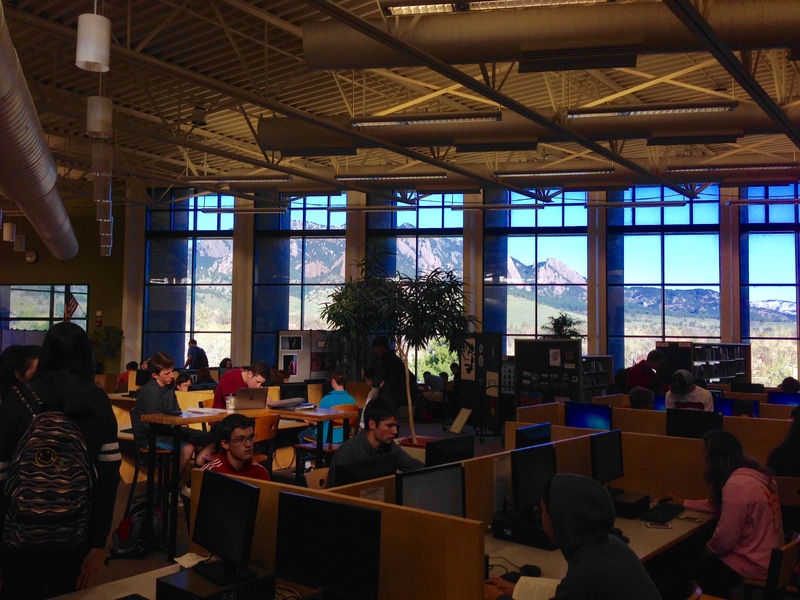 Typical scene in our school’s library, stuffed with students working on various things. It’s gorgeous with floor-to-ceiling, wall-to-wall windows overlooking a park with a lake and the mountains that border the west side of our town. Our students love hanging out there. And our librarian does a fantastic job keeping the library stocked with the titles students want to read. She will order any books we want to add to the collection. There are limitless audio books. There are e-readers and the ability to download any title students want that is not in the library. And the library is only a short walk from any of the language arts classrooms. My class spends a lot of time there anyhow (using the computers/chromebooks there so I can get my students’ hands on devices more often each week). I find myself frequently walking among the library shelves with my students, recommending titles to them. Why can’t this beautiful, vibrant, library full of current, engaging titles function as my students’ primary source for their independent reading books? Lots of conversation about books. Book talks. Small group conversations. Students making recommendations to each other. Consistent class time reserved for reading. Students learn to value what we spend time in class on. Reading as writers–use independent reading books as mentor texts for writing. I see ways I can achieve these things without the physical classroom library. I already do for some of these: We read every day–it’s how we start class. Students have their books on them every day. And this daily reading time provides daily opportunity for reading conference conversations with a few students. To make reading a central cornerstone of the class, students read books that they choose to be able to complete long-term projects. I’ve done a variety of things with this (here is what my seniors just did, and here is what my freshmen just did, both tasks tied to the year-long essential questions for each course), but by the end of each semester, I ask students to make use of what they’ve learned through their independent reading to complete end-of-semester presentations, projects, and reflections. There are places I want to get better: after reading Writing With Mentors this summer, I want to make mentor texts much more central to my writing instruction, and I want to find ways to have students turn to the books they’ve chosen on their own to be their writing mentors. And I want to build some online resource (a blog I’m thinking) full of book recommendations that students can hunt through, tagged by topic and genre, with each book’s page a place for students to leave short recommendations about books. Good Reads may already accomplish this (and I’ll take a close look there), but I’m thinking about using Blogger or Word Press to craft something that my students and colleagues and I can build together. I’ll need to actively recruit a student assistant to be in charge of adding new book titles to it as students read them so the resource can grow before students’ eyes. And it will have their ideas, interests, words, thoughts all over it. What does this novel argue? What is it asking you know know about the human experience? How does the novel make that argument? Which moments/pieces/components are most important to the book’s ability to make that statement? Is it true? Is what the book says a true reflection of human experience? If so, how does it change you? These were my favorite conversations about reading I had with students all year. We spoke about books and my students’ worlds as human beings, reflecting on how the characters and their struggles resembled our own, on how the books taught us what it means to be human, about how the authors worked intentionally to bring those thoughts to our minds. And from these group conversations came some excellent writing about their books too. I definitely want to create more space for this kind of talk about books–it does so much toward creating a community of readers that devours books in each other’s company. And this kind of conversation doesn’t seem to be reliant on the presence of a classroom library, right? How do you manage this classroom library issue if you don’t have your own classroom where you can construct a library, title by title, over the years? This entry was posted in 21st century teaching and learning, literacy, making change, reading, teaching reading, workshop teaching. Bookmark the permalink.